The Man vs. The Baddest Woman on the Planet! 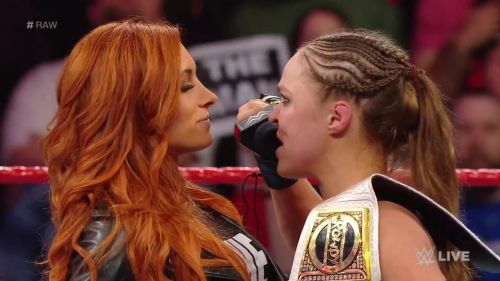 Becky Lynch returned to Monday Night Raw and declared that she would challenge Ronda Rousey for the Raw Women's Championship at WrestleMania 35. "The Man" confronted Rousey after the Raw Women's Champion defeated Bayley in an open challenge. With the crowd hyping her up and Rousey visibly distraught, Lynch talked about her journey to confronting Rousey again and immediately declared that she would be challenging for the Raw title. Rousey would respond by listing her accomplishments in MMA and WWE before saying that she would defeat Lynch. The tension between Lynch and Rousey has been building since Survivor Series 2018 when Lynch was the SmackDown Women's Champion. The plan was for Lynch and Rousey to wrestle in November, but the match was canceled after Lynch suffered a broken nose and concussion after Nia Jax punched her in the face during the go home show for Survivor Series. Charlotte Flair was chosen by Lynch to take her place in the match, but Flair lost via disqualification after she used a kendo stick to attack Rousey. Flair, Lynch and Rousey went back and forth on Twitter after the events of Survivor Series, but Rousey would target both women when she cost them the SmackDown Women's Championship at the TLC pay-per-view. Lynch won the Women's Royal Rumble after she replaced Lana, who was unable to compete due to an "injury". Flair and Lynch were the final two competitors, but Lynch prevailed to the delight of the fans at Chase Field. The original match for Rousey at WrestleMania 35 was for Flair to challenge her for the title, but the plans changed when the company booked the match for Survivor Series. The current rumor is that Flair will be added to the match at some point in the buildup to WrestleMania, making it a triple threat for the Raw Women's title. This match is also rumored to headline the show, which would make it the first women's main event in WrestleMania history.